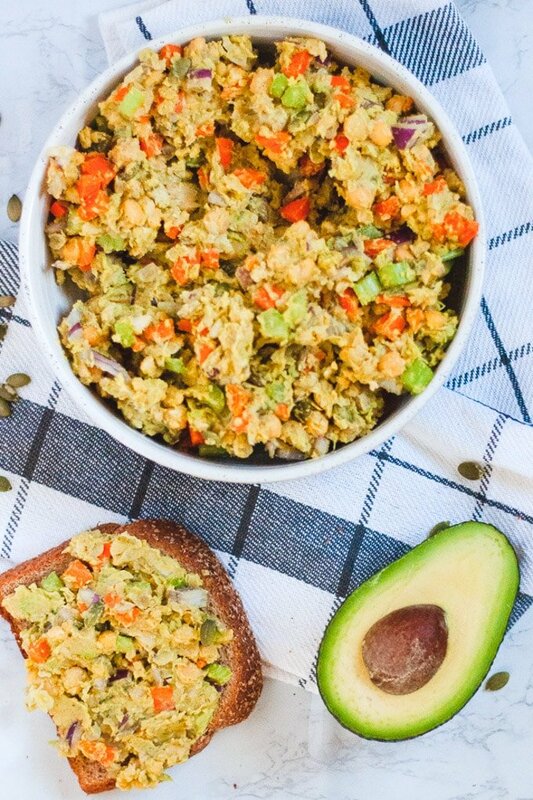 Chickpea Avocado Salad is a healthy plant based meal, and it takes just minutes to make! This salad is perfect for meal prep and tastes delicious on sandwiches, wraps, or on a bed of lettuce. I love chickpeas. 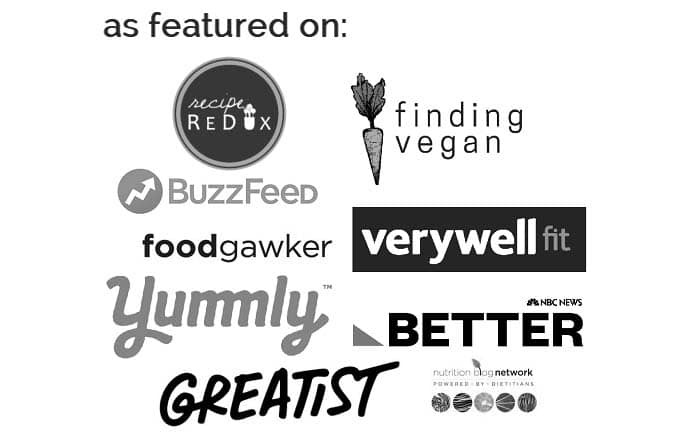 They’re just so versatile and full of nutrition! 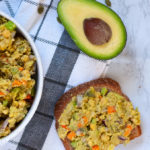 There’s chickpea dessert hummus, chickpea vegan mousse, avocado chickpea salad… not to mention that avocado chickpea salad itself is super versatile and can be enjoyed in a salad or on a sandwich! Growing up, chicken salad sandwiches were one of my favorite lunches. As soon as I started eating vegetarian, I tried out the obvious vegetarian alternate: chickpea salad sandwiches. I was blown away by how good these sandwiches are! 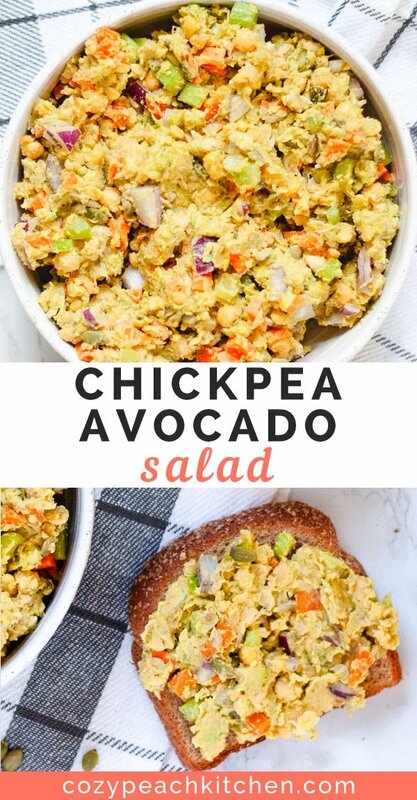 Chickpeas are a great alternative to the classic chicken salad, because they mash up easily and they’re packed with protein. 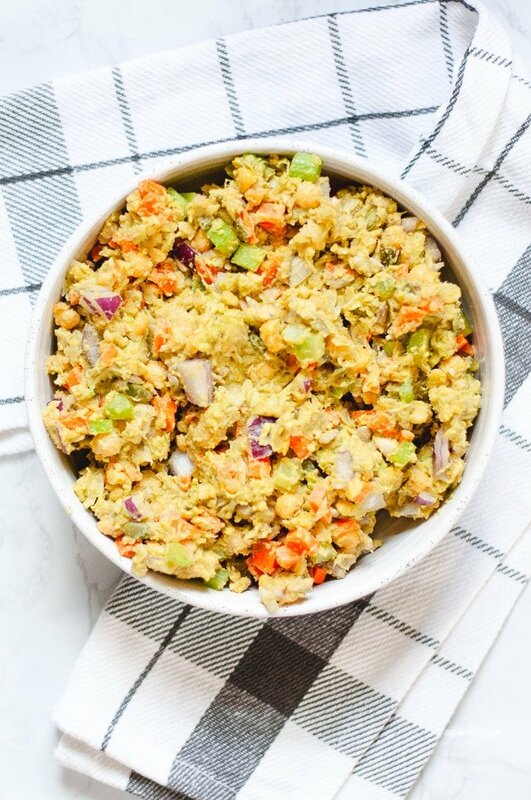 Add in some classic chicken salad ingredients and you’ve got yourself a delicious plant based meal that’s filling and nutritious. 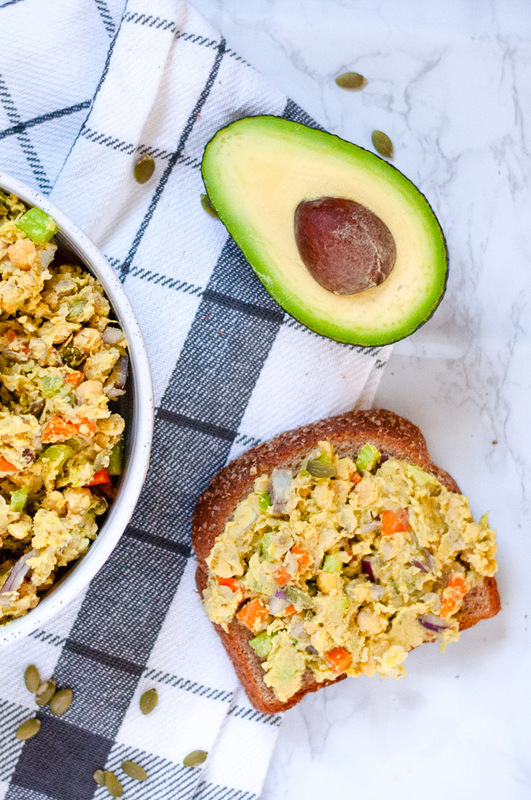 I’ve been eating chickpea salad sandwiches for years, but it wasn’t until recently that I realized I could take this classic sandwich a step further with avocado! Avocado + chickpeas = a filling and nutritious sandwich base! Not only are avocados a plus for texture (so smooth and creamy! ), they’re also loaded with healthy fats. Two thirds of the fat in avocados are monounsatured fats, which are considered “good” fats. The extra fat also means you’ll be fuller for longer. Okay, are you ready for how easy this is? Just mash together chickpeas and avocado with a fork or potato masher. I mash the avocados and chickpeas until they’re about 75% broken down and 25% whole chickpeas. If you want a 100% mashed salad, keep mashing to desired consistency. Stir in the seasonings, chopped veggies, and add-ins. Once everything is mixed together, you’re done! Like I said, so easy! 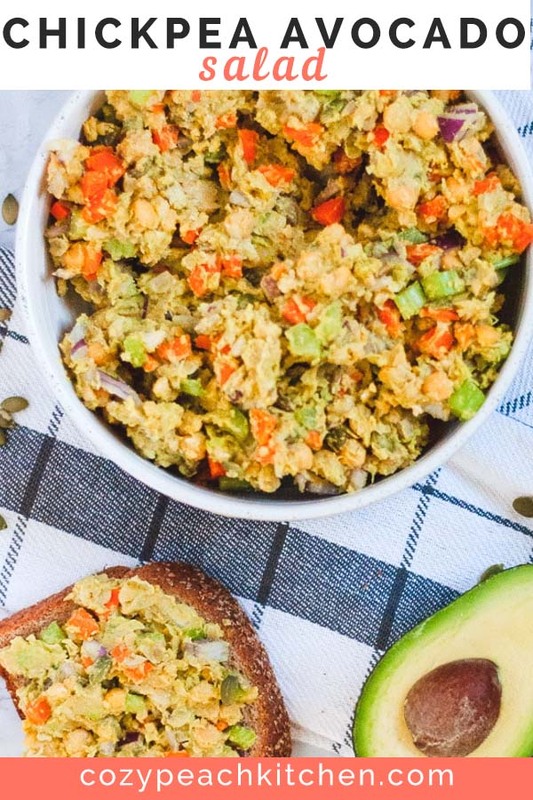 Spread your chickpea avocado salad on a slice of toast, use as a dip for veggies, or come up with another creative way to enjoy your avocado chickpea salad. Have an extra can of chickpeas to use up? This is my favorite classic chickpea salad recipe, and these curry chickpea salad wraps are a fun and flavorful twist on a classic recipe. And let’s not forget about this truly cozy chickpea noodle soup! Quick and easy meal prep recipe made with whole food, plant based ingredients. Works well as a sandwich filling, on a salad, or as a dip. Remove the skin and seed from avocado. Add avocado to a bowl with chickpeas. Mash with a fork or potato masher until mostly broken down a few whole chickpeas remain. 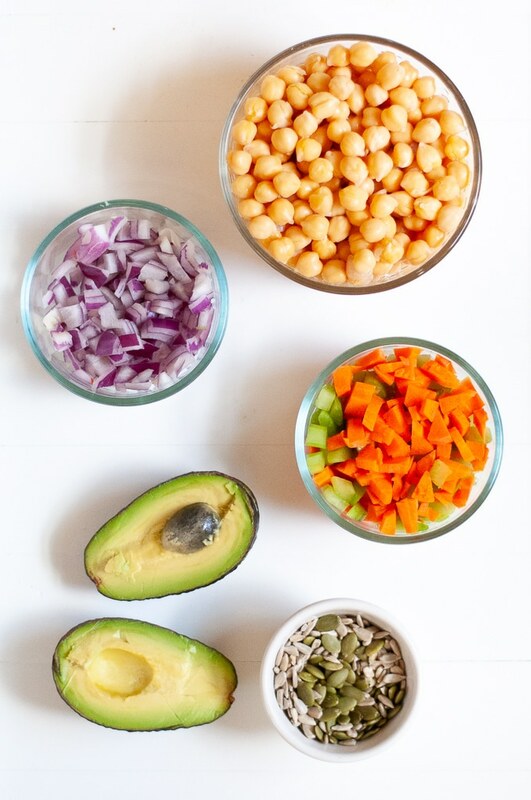 Add remaining ingredients to the chickpea avocado mash. Stir together until thoroughly combined. Enjoy cold on sandwiches, salads, or as a dip. Store in a refrigerated container for about 5 days. 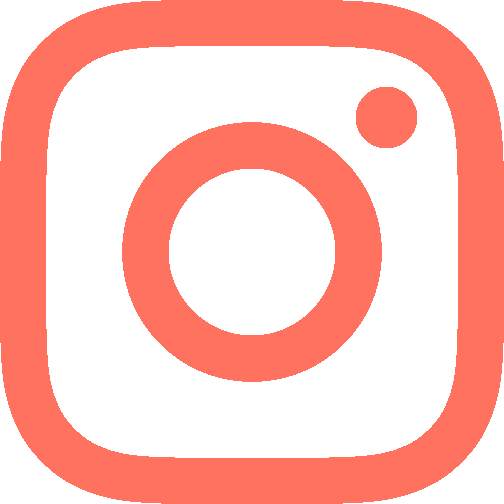 Nutrition information is an estimation and may vary based on brands and measurements.